This month Adventists around the world were stirred by yet another controversy over end-time events—this time it was about setting a time-window for the close of probation. The leader of an independent ministry referred to certain experiences, dreams and impressions to predict the time of the judgment of the living and close of probation for the church. This runs counter to the solemn counsel we posted two years ago regarding messages on time frames predicting future events. It also ignores principles of already-fulfilled prophecies, re-applying certain time frames without solid prophetic basis. Many also forgot about Miller’s Rules. They were caught up in enthusiasm for the preacher, and many even defended him, it seems without understanding the objections that others brought against his methods and conclusion. This issue is an example of dear souls being stirred up by something that is not firmly grounded in truth, and that affects the foundation of their faith in a way they may not have realized. It also can prevent their settling deeply and strongly in the message. SDA Bible Commentary, vol. 4, p. 1161. “Every position of truth taken by our people will bear the criticism of the greatest minds; the highest of the world’s great men will be brought in contact with truth, and therefore every position we take should be critically examined and tested by the Scriptures. Now we seem to be unnoticed, but this will not always be. Movements are at work to bring us to the front, and if our theories of truth can be picked to pieces by historians or the world’s greatest men, it will be done. Have you ever considered what this will mean? Would you be prepared to defend your faith down to the most intimate detail? Knowing that the seal is a settling into the truth, what would the enemy want to do? There it mentioned the two elements of the sealing – being decided on the truth (settled intellectually) and pure in heart (settled spiritually). It also said that the strategy of the enemy is to keep the minds of as many people as he can, wavering and unsettled on the truth. There are many things that do this – the cares of life, pleasure seeking, overwork, entertainment, and so forth. However, it seems that there are more movements in doctrinal variation than ever before. Here and there someone comes up with a theory that is peddled as truth. Please remember that these are not harmless diversions. (Error is never harmless – see the article The Importance of Truth). Our focus should be to become settled in the truth, to understand the good old message and be certain of what it is. The time spent “chasing the wind” – the roller coaster of various side issues and winds of doctrine – is worse than wasted. It does NOT prepare the mind to be settled in the truth.And many of these “winds of doctrine” contain subtle elements that undermine the platform of truth. Ironically, the message that was supposedly intended to wake up God’s people will no doubt contribute to distracting many from the real work of preparation for the judgment. “Satan invents unnumbered schemes to occupy our minds, that they may not dwell upon the very work with which we ought to be best acquainted. The archdeceiver hates the great truths that bring to view an atoning sacrifice and an all-powerful mediator. He knows that with him everything depends on his diverting minds from Jesus and His truth. “Those who would share the benefits of the Saviour’s mediation should permit nothing to interfere with their duty to perfect holiness in the fear of God. The precious hours, instead of being given to pleasure, to display, or to gain seeking, should be devoted to an earnest, prayerful study of the word of truth. The subject of the sanctuary and the investigative judgment should be clearly understood by the people of God. All need a knowledge for themselves of the position and work of their great High Priest. Otherwise it will be impossible for them to exercise the faith which is essential at this time or to occupy the position which God designs them to fill. Every individual has a soul to save or to lose. Each has a case pending at the bar of God. Each must meet the great Judge face to face.How important, then, that every mind contemplate often the solemn scene when the judgment shall sit and the books shall be opened, when, with Daniel, every individual must stand in his lot, at the end of the days. The Great Controversy, pp. 488, 489. Perhaps the most worrying part of the experience of the past few weeks has been seeing people sidestep that process of personal investigation, in their loyalty to a particular preacher who seems sincere. We do not question his sincerity either, or the urgency of the hour. But in a time when every deception will be thrown at God’s people, it is not time for taking a position on scant evidence, on impressions or dreams or hearsay. In the time of real crisis, these will all melt away. And if that is what you have based your faith on, you will be sadly set adrift without an anchor. This site exists to try to encourage God’s people to be settled on the truth, not continually unsettled by being tossed around by the tides of opinion and the latest sensational movement. We each owe it to ourselves to become settled “both intellectually and spiritually” so that we may not be moved, come what may. 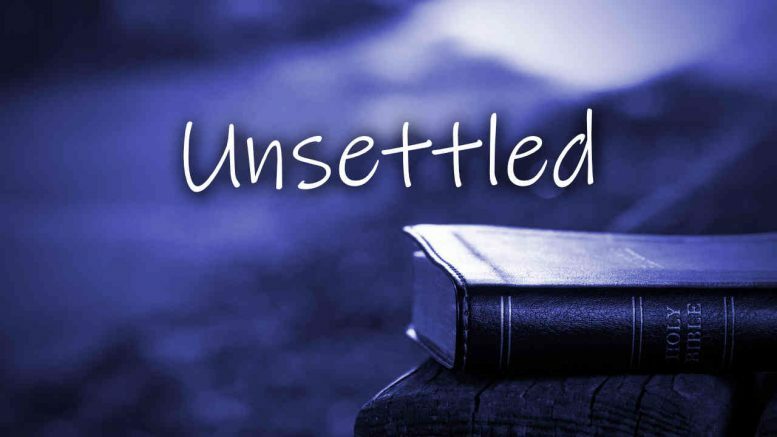 Be the first to comment on "Unsettled"